Talk about taking political bribes. Member of the U.S. House of Representatives Michelle Bachmann was given more than US$25,000 for a trip to Israel for herself and her son earlier in November. The $25,000 covered accommodation at the luxurious David Citadel Hotel in Jerusalem, shopping in Old City and visits to Joseph’s Tomb Overlook, Shiloh, Bethlehem, Hebron, Jordan Valley, Golan Heights, and a boat ride on the Sea of Galilee. The U.S. Israel Education Association sponsored Bachmann’s visit along with that of other members of the U.S. House Representatives and their families. Their trip also included a tour of the Israel Aerospace Industries and the Defense Ministry. Of course nothing in life really comes for free, especially in politics and all the more so when Israel is involved. So in return for Zionist hospitality those Representatives making the trip were expected to return the favour, in one way or another. For some this may include voting for proposals that might favour Israel or opposing moves to relax sanctions on Iran. 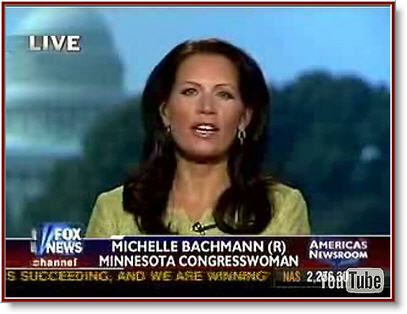 In Rep. Bachmann’s case she has already started to return the favour. The Geneva accord with Iran has left Israel “abandoned”, forcing the Zionist state “in her time of greatest need… to stand alone,” Bachmann said. “It is one thing to be a friend of Israel when the sun is shining, and when times are good… it is another to be a friend of Israel and to make the case that Israel not only has the right to exist but the right to defend herself, and that right may possibly include the right to be able to bomb nuclear facilities and potential nuclear facilities in Iran,” she continued. It’s true that Bachman’s not unattractive and her appeal plays a part in her role as an advocate for Israel. Here she is being given luxurious all-expenses trips to Israel one week and the next she’s mouthing the sort of lines that must be music to Israeli Prime Minister Netanyahu’s ears. In her own way Bachmann is lower than the lowest street-walker. Although she isn’t selling sexual favours, she is effectively selling her charms to advocate a line that could ultimately result in war and the widespread loss of many innocent lives. If there is a hell I’m sure there is a special place in it for political whores like Michelle Bachmann. Michele Bachmann’s quotes courtesy Press TV.